"Honoring The Fallen" proudly salutes the valiant ones who made the ultimate sacrifice ... who went beyond self ... for our beloved America that includes my mother's twin brother, who did so in the hedge rows of Normandy shortly after D-Day. Special Note... The A signed printing of the "Honoring The Fallen" poem was made available to the USO for sharing at its Dover AFB facilities where the fallen are returned to America and their waiting loved ones. The poem might also be available at other USO locations. Knowing there was no more ticking for this clock. Giving it birth and to protect ... not take. The blinding tears of TAPS being played. The overwhelming sadness of the colors given. The proud thought of the difference made. The final salute to the fallen . . . now in heaven. Like every time when seeing the flag wave! "Honoring The Fallen" and "Tears For Your Fallen" are included in my book, American Pride. "A Grateful Nation Remembers . . . is a tribute image honoring all those brave ones . 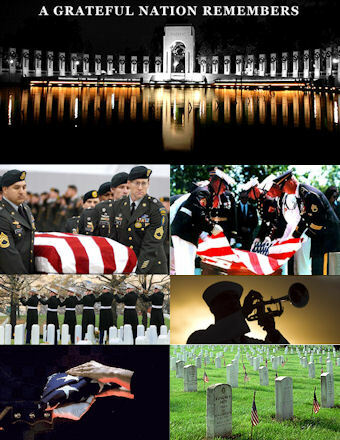 . . who made the ultimate sacrifice in military service to our beloved, great America since the fight for Independence. It is a reminder of each fallen's final, priceless act . . . to defend and preserve the USA along with safeguarding their fellow citizens' freedoms . . . that are unequalled. It reflects why America's exceptionalism is unique . . . in what will be done for country's sake and the honor bestowed for doing so . . . allowing America to remain the shining beacon of liberty for all to see!" My poem, Honoring The Fallen, underscores the message of the A Grateful Nation Remembers image."